Our regular retail shopping hours have concluded, but we’ll be happy to meet you at the nursery so that you can purchase a container tree. It can be brought indoors for a short while, and then planted outside. Purchase your tree now and dig a hole before the ground freezes. Keep your tree outside and water as needed, keeping in mind that plants in containers tend to dry out more quickly than ones planted in the ground. When you are ready, gradually introduce your tree to indoor temperatures by moving it to an unheated garage or porch for a few days before bringing it inside. Check for insect egg masses or other unwanted critters. Find a cool spot for your tree, away from ducts and heat sources. Place the container in a tub to minimize watering mess. Keep it indoors for up to 10 days and water as needed. After the holiday, move it back to the porch or garage for a few days and then plant it in the hole you prepared. Water after planting and whenever the ground thaws and appears dry. And enjoy the fact that you are providing important habitat for songbirds. Hemlock, 3 gallon container, $35 (approx 2′-3′ tall). 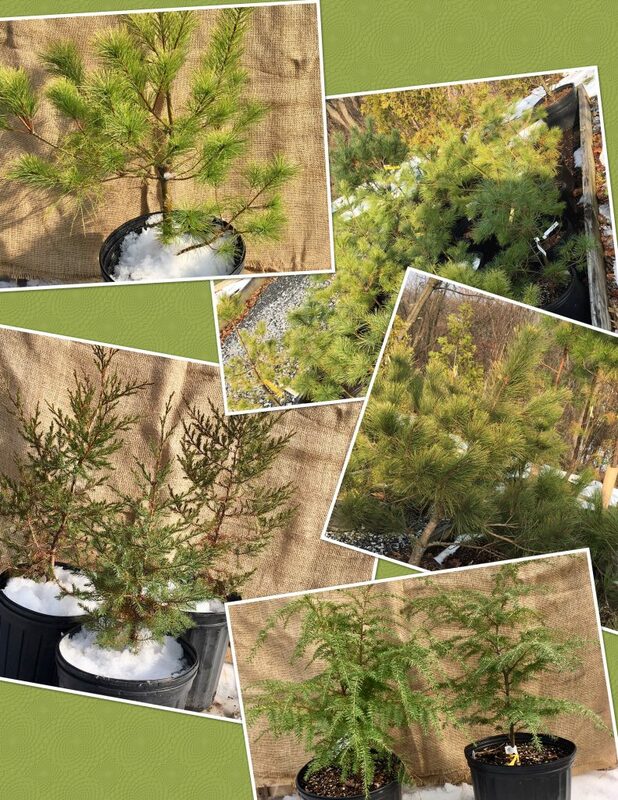 If you are interested in purchasing a container evergreen,we’ll be at the nursery 10 am to 2 pm on Tuesday December 11 and Thursday December 13 WEATHER PERMITTING to help you make you selection. If that time does not work for you, please email Brian @ edgeofthewoodsnursery.com to make arrangements to meet us at the nursery. Gift cards can be used to make purchases in the nursery and to pay for consultation or design services. We can mail the card to you or directly to the recipient, via U.S. Mail. More details can be found here. I just LOVE Edge of the Woods!!! What wonderful people and great plants, thanks for working so hard to give us a place of peace and enjoyment.